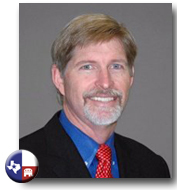 James Matthew Duerr is a Republican candidate for the Texas 27th Congressional district with aspirations of unseating the 27 year Democratic incumbent Solomon Ortiz. Duerr is currently serving as a board member on the Board of Regents at Del Mar College as well as on the Nueces County Appraisal District. He served as Vice Chairman of the Leadership Corpus Christi Alumni and as Sergeant of Arms of the Corpus Christi Rotary Club. Duerr is also an Eagle Scout and has served on the board of the San Patricio Economic Development Corporation. James Matthew Duerr is very active in the church community and says that "it is important to raise families and live in the Spiritual awareness of God." Duerr is holding a town hall meeting on September 2nd to discuss health care reform to citizens, since the current district's Representative refuses to do so. Click here to learn more about the Real Town Hall event. You can also become a supporter of James Duerr on Facebook.